The end is nigh, both of winter and of Passover (Pesach). My husband’s culinary efforts for two sedarim were greatly enjoyed. He has made his matzah brei and I plan to make chremzlach Thursday or Friday morning. Instead of planning logistics for taking the Pesach dishes, etc. out, we are planning the most efficient way to put everything back and making mental notes for next year. Reform Jews and Jews in Israel observe seven days, as prescribed in the Torah, while Conservative and Orthodox Jews observe eight. Hey, if we going to go through such meshugas for weeks beforehand, we might as well get as many days’ use out of all this as we can. But no more than eight. April 10, 7th day Pesach Exodus 13:17-15:26 The splitting of the Re(e)d Sea, the Song at the Sea. Num. 28:19-25 The Passover sacrifice. Same as first two days, minus verses 16-18. II Samuel 22:1-51 David’s song of thanks for rescue from Saul et al. Also the Haftarah for Ha’azinu in the fall. Contains Psalm 18. April 11, 8th day Pesach Deuteronomy 14:22-16:17 Tithes. Sabbatical year (5775 is one, BTW). Levites. Slaves. Consecration of first born. Holidays: Passover, Shavuot, Sukkot. Num. 28:19-25 Ditto Isaiah 10:32 – 12:6 Messianic vision, which we’ve been leading up to since Shabbat Shekalim. It is customary to read the Song of Songs (Shir HaShirim, aka Song of Solomon,) on the intermediate Sabbath of Passover. There isn’t one this year, so we could read it on the 8th day, but services are already long then, so we generally skip it. But it’s still lovely to read at home. Yes, I know it’s interpreted by the rabbis to be an allegory of the relationship between God and Israel, but I prefer a literal translation, full of love and desire, redolent with flowers, spices, and perfume. I can’t help being somewhat superstitions (the Polish Jewish genes), but I look around at trees starting to wake up and daffodils and my purple crocuses, and I believe, in spite of another cold day, that, yes, it’s safe to say that spring has come. It is traditional to count, day by day, 49 days from the 2nd day of Pesach until the holiday of Shavuot, referred to as “Sefirat HaOmer,” commemorating the offerings of an “omer” of barley. Nowadays, you can download “apps” to a handheld device, like an iPhone or Android to remind you and help you keep track. (No, I don’t have one. My cell phone does little besides make and keep track of phone calls.) See, for example …http://apps.mosheberman.com/ , https://play.google.com/store/apps/details?id=com.turel , and https://www.rustybrick.com/iphone-sefirat-haomer.php . When it comes to Karpas, who is the king of Passover? A. Elvis Parsley!! 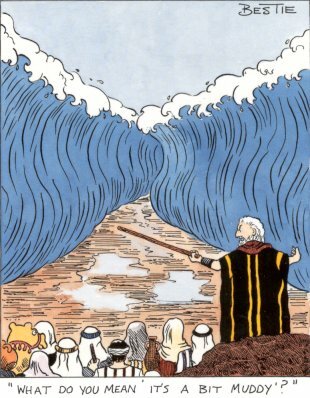 Why wouldn’t Moses let anyone use his staff? He couldn’t part with it. Celluloid art created the special effects of the Red Sea parting by pouring 300,000 gallons of water into a tank and then playing the film backward. The illusion of the Red Sea parting was achieved by large “dump tanks” that were flooded, then the film was shown in reverse. The two frothing walls of water were created by water dumped constantly into “catch basin areas” then the foaming, churning water was visually manipulated and used sideways for the walls of water. A gelatin substance was added to the water in the tanks to give it more of a sea water consistency. Although the dump tanks have long since been removed, the catch basin section of this tank still exists today on the Paramount lot, directly in front of the exterior sky backdrop, in the central portion of the studio. It can still be flooded for water scenes, but when not being used in a production, it is an extension of a parking lot. Rube Goldberg’s Passover Seder at Technion. 10 My beloved spoke, and said unto me: ‘Rise up, my love, my fair one, and come away. 13 The fig-tree putteth forth her green figs, and the vines in blossom give forth their fragrance. Arise, my love, my fair one, and come away. This entry was posted in Uncategorized and tagged Egypt, Exodus, Jewish holidays, Moses, Passover, redemption, sacrifices, sefirat haomer, Song at the Sea, Song of Songs, spring. Bookmark the permalink.